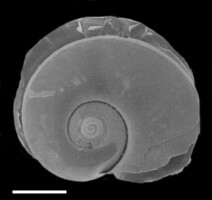 Atlanta frontieri is a moderately large species (shell diameter to 5.5 mm) that is immediately distinguished by an elevated spiral ridge located at the outer edge of the second to fourth spire whorls. The spire consists of 4-1/4 to 4-1/2 whorls. 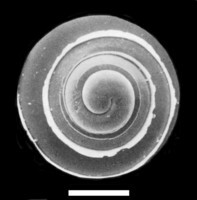 The shape of the spire is unusual; the third and fourth whorls are very low, while the first two whorls form a raised cap. 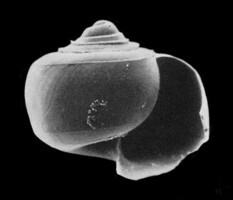 The keel is tall and rounded, inserting between the penultimate and final whorls in shells larger than about 2 mm. 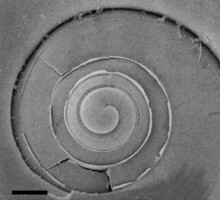 Eyes type b. Operculum type b. Radula type II, with the number of tooth rows (44-50) the lowest in the genus Atlanta and moderate sexual dimorphism in the marginal teeth. 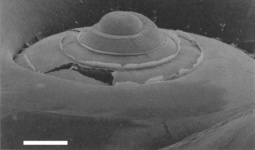 Recorded from the Indian Ocean and western North Pacific Ocean; vertical distribution unknown. 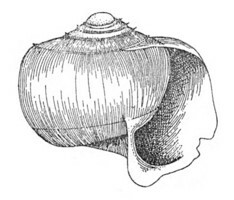 Tokioka (1955) was the first author to illustrate Atlanta frontieri in an apertural view of the larval shell (see Tokioka's drawing above); erroneously identifying the shell as belonging to A. inflata. In 1966 Frontier briefly described and illustrated the same species as A. peronii. In his monograph on the Heteropoda of the Indian Ocean, Richter (1974) followed Frontier's (1966) lead and incorrectly characterized the species at hand as A. peronii. Nineteen years later, Richter (1993) corrected his misidentification from 1974 and described A. frontieri as a new species. In this paper he also reported that the new species shared a series of characters (notably the same eye, opercular and radular types) with A. peronii and the other two members (A. rosea and A. fragilis) of the A. peronii species group. 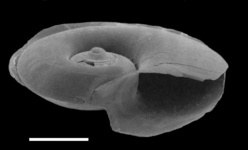 Atlanta frontieri has been recorded from the western North Pacific by Tokioka (1955; see above), although the species has not been reported from Hawaiian waters (Seapy, 1990) or off the U. S. west coast (Seapy, pers. obs.). Also, Newman (1990) did not record it from eastern Australian or New Guinean waters. The majority of records of the species are from the northern Indian Ocean, where Richter (1974) recorded it as the sixth most abundant atlantid species in his samples. Seapy et al. (2003) also reported it from the southeastern Indian Ocean. Thus, A. frontieri must be regarded as an Indo-Pacific species. The vertical distribution of A. frontieri has not been investigated. Tokioka, T. 1955. On some plankton animals collected by the Syunkotu-Maru in May-June 1954. II. Shells of Atlantidae (Heteropoda). Publications of the Seto Marine Biological Laboratory 4: 227-235. Page: Tree of Life Atlanta frontieri Richter 1993. Authored by Roger R. Seapy. The TEXT of this page is licensed under the Creative Commons Attribution License - Version 3.0. Note that images and other media featured on this page are each governed by their own license, and they may or may not be available for reuse. Click on an image or a media link to access the media data window, which provides the relevant licensing information. For the general terms and conditions of ToL material reuse and redistribution, please see the Tree of Life Copyright Policies.